Tucker is 12 months old. I can't believe it's been a year. 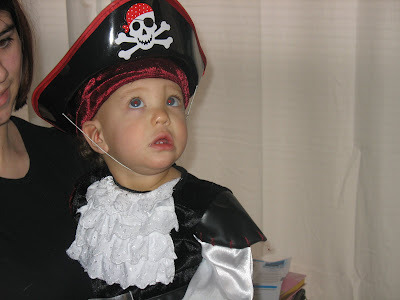 We had a pirate party to celebrate. I was getting the flu and my back ached that day, so I wasn't a happy camper. 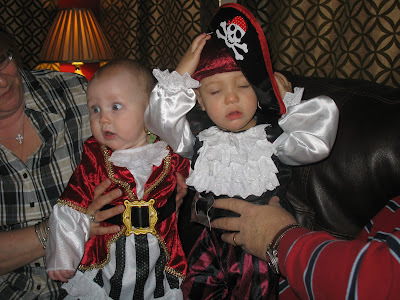 But Tucker and Butterball, his pirate princess, had a great time. Are you kidding me with this stupid hat, mom? I'll never get tired of those big blue eyes. Butterball was ready to party! Even ABW's Jr. dressed the part! 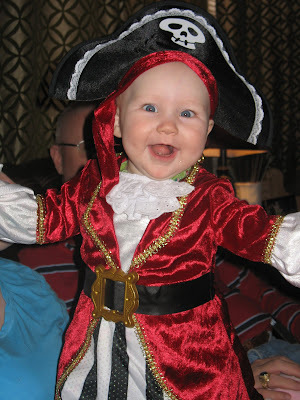 And he kept walking around saying, "ARRRH! 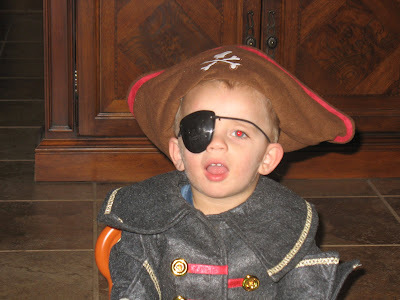 I'm a pirate!" It was cute. Jr. helped Tucker open presents. 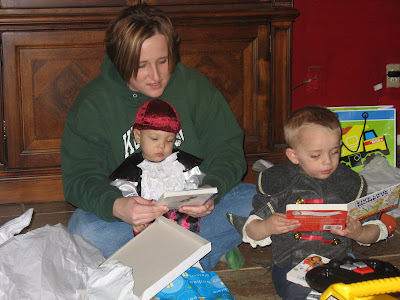 I love this picture - two pirates just hangin' out reading books! Awwww! Happy Birthday Tucker! That is sooo awesome! Happy Birthday Tucker-- these pictures are too cute! And those blue eyes-- wow! Josh here. Very cute little boy. I miss my son after seeing Tucker's photos. Adorable! Thank you for posting again.... I feel better when I can 'read' you!